Monocentropus balfouri Pocock, 1897, also known as “Socotra island blue baboon”, is a very remarkable bird spider due to its coloration and behavior from Socotra-island, part of the Republic of Yemen. However she’s been linked with baboon spiders, she belongs to the subfamily of the Eumenophorinae and not the Harpactirinae. African bird spiders are commonly given the title of baboon spider, which explains why she carries the name. The species is very popular amongst hobbyists, because of their cuddly appearance and communal capabilities. In 2014 she was even voted the most beautiful bird spider on earth (source). 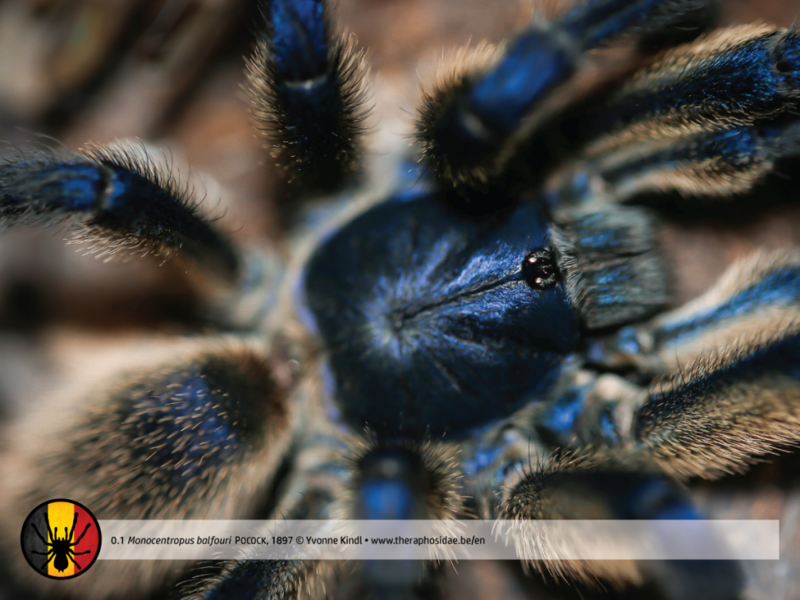 More than 30 spiders have been described, but Atrophothele socotrana and Monocentropus balfouri are the only endemic species from Socotra belonging to the suborder of the Mygalomorphae. Variants in coloration, from red to amber, have been found in 1999 and 2003. However this is very exceptional, it’s the same species slowly transforming into a beauty with colors as seen on the photo. Common name: Socotra island blue baboon. Venom: Spiders would have played a major role in hiding the prophet Mohammed, explaining why the Aboriginals are showing big respect towards our eight-legged friends. They’re, however, not so tolerant for the Monocentropus balfouri. They are convinced that its venom is so strong it can kill a dromedary. Lots of investigation on its toxicity still needs to be done, but it’s very unlikely the venom is that strong. Keep in mind Monocentropus balfouri is an old world tarantula, probably possessing stronger venom than the avarage new world tarantula. Depending the location of the bite and the amount of venom released, this might be a painful experience. Origin: Socotra, part of the Republic of Yemen. The high degree of endemism on Socotra is a result of complete seclusion, which makes the entire archipelago (Socotra, Abd-al-Kuri, Samha en Darsa) extremely interesting for both biogeographical and evolutionary reasons. Some of the endemic species in the Haghier mountains are probably the remains of ancient fauna and flora, as the location never overflood since Mesozoïcum. Therefore Socotra is listed as World Heritage by Unesco. Behavior: The spider will try to flee at first. She’ll not hesitate to start stridulating in an impressive threat pose or answering persistent provocation with a bite. Females with a cocoon won’t give warning signs, striking faster than you might have expected. Interesting is the fact Monocentropus balfouri can be kept communal. Provide a correct amount of food in order to prevent cannibalism. This semi-social lifestyle is very special for a bird spider. Similar behavior has been observed by Ischnocolinae (Neoholothele spp., Heterothele spp. ), Eumenophorinae (Hysterocrates spp.) and some species of the Poecilotheria-genus.  Monocentropus balfouri will create a very interesting and beautiful webcomplex, especially when kept communal. Life expectancy: Females become up to 10-14 years old. Males are given a shorter lifetime of 3-4 years. Socotra has a steppe climate. Due to its location in the Indian Ocean temperatures are always the same. Shade temperatures fluctuate between 30-37°C, dropping to 23-27°C at night. Higher areas can be rather cold, reaching temperatures of 10°C at night. Please be informed of the fact the spider will protect itself against extreme weather conditions creating a thick web underneath and above tree trunks, rocks, branches and leaves. 37°C is not optimal for the spider. Another sources mentions environmental factors can fluctuate with tens of degrees and from extremely dry periods to intense monsoon, indicating this spider is quite hardy (D. Lister). This same source mentions rainfalls are more frequent at higher altitudes, which is in contrast with the foundings of Andrew M. Smith (who claims rainfalls are rather rare, but humidity is between 70-85%). Besides a few exceptions, Monocentropus balfouri is mostly found at higher altitude (850m+). Do not overheat the terrarium. Humidity: 55-70%. Humidity may sporadically rise to 70-85% during july and august. * A rather dry environment doesn’t indicate survival without water. Spray the web every now and then (2-3 days). Adult: LxWxH: 30x25x20. Min. 3x span width in surface. Chose a larger terrarium if you’re keeping them communal. * Provide enough hiding places for the bird spider(s). Adult: Min. 1-1,5x body length. Smaller than adult: Minimal 1-1,5x body length. * Keep the substrate rather dry. A humid environment can have disastrous consequences for Monocentropus balfouri. Wet season: None. In July and August it might rain (max) 1 out of 3 days. Dry season: All year long. Warmest months: All year long 30°C (and more). Coldest months: None. Temperatures sometimes drop to 10°C (and colder) at night. Mating Monocentropus balfouri normally runs smoothly. Initially males are wary, difficult to stop from the moment copulation started. Many interactions between male and female are not unusual. After reloading in his sperm web it is recommended to present the male a few times more. • As soon as you’ve noticed the female is not coming out of her burrow anymore, she’ll probably start making the cocoon within a month. • The female will start making the cocoon 2/2,5 months after mating. Remarkably the mother takes care of her little ones for a few months. Breeding reports in which the cocoon was taken away from the mother, all went badly. Leave the cocoon with the mother, providing environmental factors as shown above. • Monocentropus balfouri was named after Sir Bayley Balfour, a collector of the Monocentropus-genus. • It is presumed that Monocentropus balfouri leaves her burrow after a molt in the wild? • Monocentropus balfouri sometimes relishes scorpions and centipedes in the wild? • Mother Monocentropus balfouri takes care of her posterity? • Monocentropus balfouri, by Dave Lister (about the prophet).